*The film is also notable for its groundbreaking cinematography by Charles Rosher and Karl Struss. The film contains the longest continuous tracking shot ever made up to that point: over four minutes in one take. These innovations have led some to call it the "Citizen Kane" of American silent cinema. * In 1989, this film was deemed "culturally, historically, or aesthetically significant" by the United States Library of Congress and selected for preservation in their National Film Registry. *2009 UK released the movie on Blu-Ray and is notable as the first occasion of a silent film being released on Blu-ray. I'm not sure what it was about this movie, but I was just not feeling it. This is supposed to be a short story, and it really felt like it. It dragged on in ways I never get annoyed with very often. The character motivations for me were non-existent in any sort of manner, even with giving the movie a bit of leeway for having had 1920's writing. Regardless, just like the criteria says, it is a beautiful movie to look at. The tale of course deals with a husband being seduced by a more sultry newcomer to the small than his own wife, and the subsequently messed up plan to MURDER the wife in order to run away together in blissful adulterous joy. By the time you get to the end of the movie, you think that the wife is a complete retard. The slightly sexist subtexts of the movie are slightly disturbing, but thankfully, this movie can't necessarily influence many young minds. As a narrative, the movie fails, the characters never get a chance to be anything but Twilight-esque shells with no real weight to them. The mistress character is hot, smokes, and wears skimpy dress. The wife is a total "prude" blond with always a sad longing look to her. And the husband is just a poor sap that has no spine in all sorts of ways. I'm sure that at some point this might have been entertaining or even thought provoking, but I'd rather see CLOSER, which I hated, than see this movie again. Jonesy: I'm reaching the point on the countdown where I'm going to start to question why movies are on this list. Granted, even though the list has some criteria, it is still pretty arbitrary. SUNRISE is one of the first films on the countdown that I would not recommend to anyone. 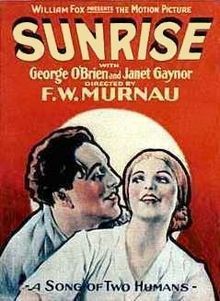 On a technical level, some aspects of SUNRISE was decades ahead. However, the story is so weak that it overshadows some of the groundbreaking tech pieces. I could imagine that during the late 1920's a man wanting to kill his wife and runaway with his mistress from the city could be pretty scandalous. But the characters ended up being so weak and static, I didn't end up caring how the situation was resolved. From the beginning, I detested the husband, and even if he was the most dynamic of the characters, he still left a horrible taste in my mouth. When his mistress angered him, he tried to choke her. When he is tempted to run off with her and leave his wife, he almost drowns her. Then he feels bad for almost killing her, so he tries to make it up to her by having a fun day in the city? A tad too bi-polar for me. Even though the actors played pretty one note characters, I always understood the emotions they were portraying. The movie does have some beautiful shots. One continuous, tracking shot during the city fair sequence was the most astounding segment of the movie. There are some gorgeous cinematography shots during the city sequence, but they're not enough to save the movie. This was actually my first experience with silent films. I'm excited to see more because the silent film-era actors had to have some acting chops. Telling the character's story just with your face and no words can be quite a feat. Not a fan of this particular silent film, but it paved the way for more films later on the countdown.